Hello! From now on, I shall add some videos that I watch regularly. Just wanted to share with you some of my Favorites. Today I am adding this video of Malabika Sen, a mesmerizing dancer from Kalamandalam Calcutta. I must have watched this dance nearly 40 -50 times. She is simply Superb. You can watch her other videos on youtube by the user name kalacal. The video is really superb! Can you explain about the meaning of her dance and her hand gestures involved? Thanks Antje for visiting the site. Let me know where you need clarification about gestures. I would love to explain it to you. 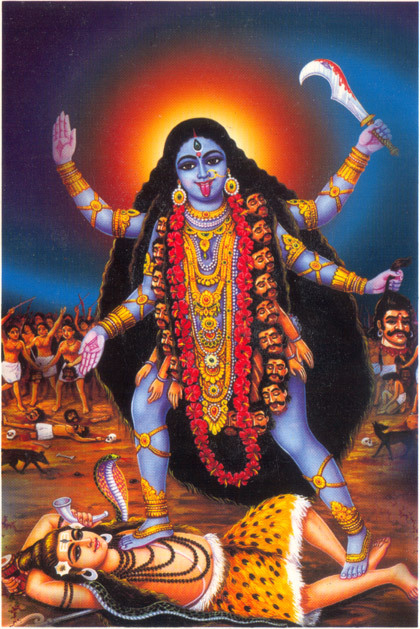 Is it right that it is a dance about the goddess Kali? Do you have the lyrics of the song? Perhaps this would also explain the meaning of her gestures to me. Yes sure I shall write another post on explaining this song and its gestures. Stay Tuned. did you already write the explanations somewhere and I missed them? Not yet Antje. I shall do it soon. What is so beautiful about this dancer is how soft her movements are combined with her perfect control. It is dreamy to wacth! I have not seen this softness in other dancing videos. Also the music is very beautiful: I would love to have a copy of it, if you know where it is from Anjali. Wow………….excellent and marvellous performance by Malabika sen.I really can’t stop dancing after watching this performance by her.I really can appreciate if you have any more videos of her posted soon. Yes, she is very graceful. The song is wonderful, and 90% of the choreography is superb indeed! If Bharatanatyam is to expand outside South India, it has to include items like this. She’s really good! I saw her spectacle in Musee Guimet in Paris on may 2008 and loved it a lot. Do you know where I can find her DVD? Hi Lu, No I donot know much about her and where her Cds are available. If you have some information or any cds do let me know. Is it right that it is a dance about the goddess Kali? Hey Nigama, i appreciate the attempt you made. It is the english spelling that must have caused the confusion. The pronunciation for Goddess Kali and Kali avatar is different. There is a difference between Goddess Kali or to be accurate Kaali and the 10th avatara of Vishnu, the Kalki. The above song describes the Goddess as one with the lotus eyes and blue complexion. Also it says she wears the ‘Munda mala’ ie a garland of skull. And Vishnu Avatara ‘Kalki’ is an amalgam of a horses head and a man’s body. Yeah, if you say so, the piece is about a goddess. of “Gita Govinda” Kalki was translated as Kalika, since I never read Kali as Kalika I was tempted to think the piece might be about Kalki. I hope you are well in your present place. Thank you Anjali Aunty for sending this video . Will you please send me some more video of this dancer ? Thanks a lot for sharing this video. Could you kindly post the lirics of the song. Also could you upload more sanskrit song videos on mother Kali, if you have? Thank you for the vidoe. Malabika Sen is a wonderful dancer. I love her bhava’s and gestures. I’m a male bharatanatayam dancer currently living in Heidelberg, Germany. Your website and efforts, have really helped me get back to the basics!! hats off to you for that! I have a query though, I want to perform this dance-kalika stotram. But since, I do not have any knowledge of Sanskrit, It would be really helpful.I could not get any translation on the nest, please help!! and certain mudras , I could not comprehend- at 0:31 she shows pathaka and tamrachudas- what are these weapons- the sickle and shield?! 1:43- which weapon does the tripathka depict? eagerly awaiting your reply and help! Thank you for your immediate response!!! it’s very nice of you to take the efforts to clear my queries!!! thanks a ton! Yes, I could get the inference from what you had interpreted! Malabika di is very graceful & wonderful dancer. I know her too closely. I am also from Kalamandalam,calcutta. This would be the performance at our golfgarden branch. Here, she was performing on goddess ‘kali’ and she was looking amazing when she performed any item on goddess ;’Durga’..